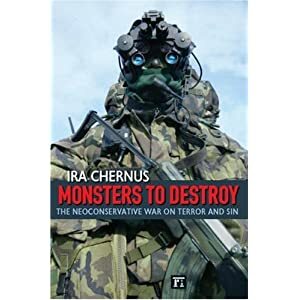 Ira Chernus is Professor of Religious Studies at the University of Colorado at Boulder and author of "Monsters to Destroy: The Neoconservative War on Terror and Sin." As Libyan rebels continue their struggle against the Qaddafi regime, the drumbeat here in the U.S. grows louder every day—not for war, or at least not for a good old-fashioned ground war, but for its modern-day equivalent: a “no-fly zone.” It sounds innocent enough, sort of like a hot summer room safely protected from flying pests. And at least we would be doing something. Bill Clinton summed up the argument: “If the leaders are on television pleading for it, I think that we should do it. They are not asking for ground troops, they don’t want us to get in the fight”—as if bombing all of the antiaircraft capabilities in Libya and perhaps Libyan airbases too were not getting into the fight. Though Clinton’s wife stuck with him through the toughest times when he was president, as secretary of state she is quite ready to refute him in public: “Hillary Rodham Clinton cautioned earlier yesterday against rushing to adopt a no-fly zone over Libya to protect anti-Qaddafi rebels and said that the U.S. must work with the international community. ‘Absent international authorization, the United States acting alone would be stepping into a situation the consequences of which would be unforeseeable,’ Clinton said. … The no-fly zone over Iraq ‘did not prevent Saddam Hussein from slaughtering people on the ground and it did not get him out of office.’” A no-fly zone won’t be a magic cure-all in Libya either, Hillary implied. That’s a hard message for many Americans, from Bill Clinton on down, to hear. After all, he used air power alone to defeat the Serbs and chase them from Kosovo, without losing a single American life. (A few Serbs did remain in Kosovo when the bombing stopped, but they were gradually expelled by the Albanians who took control of the disputed territory.) Thus Clinton’s America lived out a dream that earlier Americans had nurtured for generations: a totally painless and risk-free (at least for us) war fought wholly—and for many, it seemed, holy—from the air. Fantasy first turned into actual policy planning in the late 1930s, when Franklin D. Roosevelt was hemmed in between two competing pressures. On the other hand, FDR faced immense political pressure from the millions of Americans who simply did not believe his warnings and took them as fantasy. Today many historians agree that FDR was far overrating the capacity of the German air force. But in the early 1940s there were no definitive facts to prove either FDR or the anti-interventionists right. It was belief against belief. Roosevelt gradually won that battle of public opinion with a brilliant strategy. He directed his administration to prepare for a European war fought on the ground solely by European troops, with the U.S. offering only naval and air power. Thus he could say famously and (technically) honestly in the 1940 campaign that he would not send American boys to fight a war on foreign soil. He had turned the problem of the technological transformation of war into his political solution. As he gradually won a majority of the public over to his view, Roosevelt also spread the gospel of aerial warfare—the view that the airplane was now the decisive weapon, leaving the U.S. no choice but to build the greatest air force the world had ever seen. His faith in aerial warfare also shaped his vision of the postwar world, in which the “four policemen” (the U.S., Britain, China, and the Soviet Union) would each maintain order in their sectors of the globe. Knowing that the Manhattan Project was well underway, Roosevelt nevertheless told close aides that in the postwar world any aggressor nation would have American bombs dropped on its cities. That was the essence of his plan for keeping global order in the postwar world. Although FDR never explained this plan so crudely to the public, by the end of World War II the prestige of aerial warfare had grown immensely. The military’s postwar research, proving the limited effectiveness of bombing from the air, made little public impression against growing visions of a U.S. nuclear arsenal ruling the skies just as absolutely as any Zeus or Ba’al. The rise of American air power, as Michael Sherry has documented in his book of that name, depended on the rising power of the myth that victory comes from the skies and the skies alone. Once the Soviets got their own atomic bomb, the mythic vision had to take a new twist. Life Magazine summed it up in a series of cartoon drawings labeled “The 36-Hour War,” showing virtually total devastation on both sides. In the last drawing, Manhattan is merely a mass of rubble except for the two monumental lions still standing in front of what had been the New York Public Library. The lions’ symbolic meaning was explained in the final cartoon’s heading: “The United States wins the war.” How the U.S. wins, though, remained unexplained. Magic never needs explanation. During the 1952 presidential campaign, when Dwight Eisenhower started urging that the fighting in Korea was "a job for the Koreans … If there must be a war there, let it be Asians against Asians," he left unspoken the assumption that the U.S. would support its Asian allies on the ground with aerial bombing. This was the same blueprint that Richard Nixon would use during his Vietnamization campaign: As the number of U.S. ground troops fell, B-52s roamed the skies all across Southeast Asia—but to no avail, of course, in the end. Hillary Clinton drew the correct lesson from U.S. military history as far back as World War II: Her husband’s victory in Serbia was the exception that proves the rule. With that one exception, the myth of victory from the air has never been enacted with empirical success. But myths are not tested by empirical standards. They exist in a realm independent of empirical truth or falsehood. Invulnerable to falsification, they are notoriously difficult to shoot down. Indeed it is the myth, not the aerial bomber, that rules above us in time of war—or, as at present, in time of contemplating the possibility of war. And it exercises its power among elite leaders as much as among the masses guided by the mass media. Not all elite leaders fall under its sway, though, as Hillary Clinton’s cautionary words show. Thus far it seems that President Obama and his administration are resisting the myth, at least provisionally. Whether they can hold out much longer remains to be seen. The Pentagon is packed with vast cabinets full of plans to fight against human enemies around the world. One wonders whether anyone in the government has any plans for attacking and defeating a potent myth.